Hot on the heels of my NoSQL posts, I wanted to add a counterpoint to the discussion. After all, even though I see the value of non-relational technologies, I think it’s important not to lose sight of the value relational databases offer. In the tech world, it’s too easy to chase those squirrels of new tech (though it’s also easy to get stuck in our old patterns as well). It always helps to take a step back and see the forest for the trees so we can choose the right path for our enterprise. It is an understood fact that the tech world gets pretty dogmatic: Oracle vs. SQL Server, Windows vs. Linux, Java vs. C#, etc. People will dig their heels in about their choices and why those choices are considered “right” when, at the end of the day, each platform is simply a different approach to various higher concepts. I tend to view most of these debates as Ford vs. Chevrolet and the only real question to answer is what tool is best for the job. That being said, we all have good reasons for selecting the platforms we work with. For relational databases, it’s fairly evident that my choice is SQL Server. Before I get into that, let’s first talk about why I lean towards relational over non-relational. Don’t get me wrong, non-relational is an effective tool, but it’s still a very young technology. The platforms for it are still growing and maturing, where they still are missing a lot of the reliability we’ve come to expect from our relational platforms. Couple that with the nature of relational databases: Joins, keys, and constraints do more for us than simply organize data, they provide functionality to implement and control business logic. Data integrity is extremely important for many applications and a proper database design will provide you with all the rules to keep your data clean and ordered. Just as with choosing non-relational stores, it’s a matter of choosing the appropriate tool for the job. Sometimes that job requires tight control over your data, something that you just can’t get in a NoSQL database. As for SQL Server as my relational platform of choice, there’s a lot of reasons why I favor it over other platforms. It isn’t just because it is worked I’ve worked with (for the record, I’ve put some serious time in Oracle as well). There are really three main reasons why I will promote SQL Server as the database I think people should work with. Let’s face it, SQL Server has been around for a while and Microsoft has had a lot of time to refine it. Over the past 15 year I’ve worked with it, I’ve seen the addition of lots of neat features that enhance the core RDBMS offering. At the same time, SQL Server is still a solid relational database and gives users a solid, reliable platform for storing their data. It’s not perfect and I’ll be the last person to tell you it is, but it certainly is on par with Oracle and PostgreSQL. Microsoft has seen the writing on the wall. Some of it is from their own hand, some of it is how the data world is evolving. However, “the cloud”, in memory structures, and big data are ubiquitous in today’s tech landscape. Looking at the recent version of SQL Server, it’s apparent that Microsoft is trying to mold the product to live in this new realm. Consider Hekaton, the ability to span databases between Azure and on-premise, and improvements to columnstore (along with other updates). Microsoft is making investments to keep pace with the changes we’re seeing in the larger technology world and I appreciate the vision they have for the product. This is the big one for me. The other two basically tell me that, in going with SQL Server, I’m going to have an established RDBMS platform I can rely on along with Microsoft continuing to improve things to keep pace with other products. What sets SQL Server apart is the fact that it’s so much easier to work with, for both new folks and seasoned professionals. And that’s the second thing to talk about. Maybe I’m biased because I’ve been involved in the SQL Server community for so long, but I’m continually amazed by the amount of free material for training and best practices provided by this community, from blogs to Twitter to a user group likely nearby where you can ask questions of people using SQL Server in your area. It’s so easy to get started with SQL Server. Yeah, I know I sound like a fanboy at this point (squee!). Just so we’re on the level, I am well aware of SQL Server’s flaws. There’s a lot of things that aren’t perfect or were added a couple versions ago but were never finished up (*cough* Management Data Warehouse). And let’s not get into what’s in Standard Edition versus Enterprise. Trust me, I get it. Even with that, though, I feel that SQL Server is the preferred offering at this point for companies that are looking for a solid relational platform. Every January, many talk about what they want to accomplish in the New Year. Goal, resolutions, attempts to improve both personally and professionally. Within the community, a lot of my friends have set goals for public speaking, aiming to talk at user group meetings, presenting to their peers at their jobs, or larger aspirations. Time and again, we hear the refrain about how presenting can boost your career. I know I’ve spoken about it myself on a number of occasions. The problem for most is their first presentation and how daunting it can be. Sometimes someone’s not sure where they could first chance to speak. Other times it’s a question of finding the “right” topic to speak on. Not surprisingly, I’ve had a number of conversations in the past months with community members who are grappling with these issues. The desire is there, but they need a little guidance in order to start down the path. I think the issue of finding a venue is the easier problem to handle. Over the past two years I’ve become more involved with the Professional Association for SQL Server and I’ve gotten to know many of the local and regional organizers. Recently, I’m became one of those people as well, joining the board of the Denver SQL Server group this past January. Over this time, I’ve learned that your local user groups are always looking for speakers and typically have several different ways to help new speakers get started. A 60 minute “main event” slot, typically featuring a local or national name on a more in-depth topic. When I started my own presentation path, I got my feet wet with the 30 minute intro slot. 60 minutes is a bit much to take in for a first presentation, both for assembling material and also for the intimidation of talking for a full hour. Also, when it’s the first of two presentations in the evening, it takes some of the pressure off because there will be someone else speaking after you. Unfortunately, local user groups only meet once a month and aren’t always convenient for everyone. The good news is there are other speaking opportunities outside of these meetings for new presenters to make use of, found in the PASS Virtual Chapters. There are many of these groups built around various areas of interest within SQL Server and they’re always looking for speakers. The great thing about these meetings is that they’re held online, so that many of the scheduling and possible travelling difficulties are avoided. I personally had the opportunity to present to two virtual chapters last year and they were great experiences. It took a little while to get used to the limited audience interaction, but it also meant that I was a little more control of the flow of things. For new presenters who may be intimidated by the audience, this is a great in between step. Also, you’ll have a meeting moderator who can assist you getting things going, which helps expand the comfort zone because you basically have someone backing you up. We always talk about the Cloud and how it will change our careers. This is yet another way that it’s impacting us. Through virtual chapters, we have even more opportunities to present and reach a larger audience. Certainly, we hear every day how many of the top consultants are reaching out to the community through free training and it’s easy to observe the success they’re having. There’s no reason new speakers can’t have the same success with these very same tools. If you’re involved the community, it’s hard at this point to have not heard about SQL Saturday. I love these events and I’ve been very pleased to see the explosion in the number of SQL Saturdays over the past year. One of the reasons these events were started was to grow the SQL Server speaker base and, by necessity of the sheer number of these mini-conferences, they are continually in need of new speakers. While it may be a little intimidating to start speaking at one of these events, the benefits are amazing. Even if you have had a chance to speak once or twice already, it can’t be understated how important it is to speak at one of these, even if you have to drive a couple hours or plan a quick weekend getaway. It’s not just about the opportunity to speak, but also to network. While attendees get a chance to meet local SQL Server professionals, speakers have a chance to talk with regional and national speakers that are also in town for the event. For example, if you were speaking at SQL Saturday Albuquerque, you’d have a chance to chat with Aaron Bertrand, Steve Jones, and Denny Cherry. Lastly, the easiest place to present could be no further than your workplace. Presenting within your company has several advantages, the biggest being that you are probably already familiar with your audience. Also, you can probably have an easier time scheduling your presentation, which becomes more convenient for you. Overall, presenting to your co-workers provides you a more comfortable experience, which might be an easier first step if you’re not sure about getting up in front of a bunch of strangers. Whether you speak at a user group meeting, online, or to your team at work, you have plenty of options for a venue. “I don’t know where I could speak” is not an excuse that’s available to any SQL professional. I used this excuse for a while, but then when I spoke with my local speaker wrangler for the Denver SQL User Group, it committed me. Suddenly, I had a time and a place where I had to speak and I couldn’t back out. Well, I could, but what would that say? We’re in the tech world because we love challenges, we take on new problems, and we push ourselves outside of our comfort zones. This is just another challenge, so grasp it and help your career go further. Next week, come back and I’ll provide some additional information on the second hurdle: How to choose a topic. This (paraphrased) is what Kevin Kline(@kekline) shared as part of the Summit 2012 Women In Technology panel. While the session was intended to talk about how we can bring more women in to technology careers, it really struck me as a fantastic descriptor of the SQL Server community in general. Many fields and groups invite people in, but there’s some “thing” about the SQL Server community that makes it the most open and supportive technology community I’ve ever had the pleasure to participate in, and I think it’s this desire to share that sits at the core of our success. The Summit is built on this sharing mindset. From the speakers to the board members to the participants, the people who put this on are volunteers. Hundreds of professionals hope to be selected to speak at this event, even if just for a lightening talk, because they have something cool to share. People hang out in the halls just to talk about what can help the next guy out. What’s especially noticeable is how the community reaches out to the first timers. I know some folks were a little adverse to wearing those ribbons, but if you had a first timer ribbon, alumni of the convention would reach out and make sure you were welcome. It seems that typically, people hoard knowledge as a means of job security and a way to emphasize their superiority over others. With SQL Server, it’s more that we want others to have the fun we’re having. We work in tech because it’s fun and cool and share our knowledge so others can see the cool stuff we do. Because when all is said and done, if we’re all having fun, we’re all going further. So come in, sit down, and let me show you something cool. (This month’s T-SQL Tuesday is brought to you by Chris Yates(@YatesSQL). 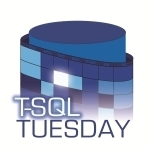 For this month’s edition of T-SQL Tuesday, Nigel Sammy(b|t) asks us to talk a bit about a feature of SQL 2012 that we’re excited about. Now, while my most favoritist SQL 2012 feature is the ability to install on Server Core, I’ve already written about that and I want to talk about something that hasn’t gotten quite so much publicity. Enter the File Table, new functionality that exposes more of the Windows file system to SQL Server. With it, we get some additional tools for file handling that before we had to do with other applications and workarounds like xp_cmdshell. A File Table is a special type of table in SQL 2012. It’s got a fixed set of columns and points at a directory managed by SQL’s FILESTREAM technology. If you do a SELECT from the File Table, you’ll get a listing of all the files within that directory. What’s cool is that “inserting” rows into this table is as copying files into the directory. Once a file is in there, we can use use SQL to do other operations, like copying files between two different File Tables, or cleaning up old files based on the file dates or archive flags. Setting up a File Table doesn’t take much, but since it uses FILESTREAM it can be a little tricky. The first thing you need to do is actually enable FILESTREAM for your SQL Server instance. To do so, just follow the steps from MSDN. For the purposes of this, I’m going to set up my share name as my instance name, SQL2012. This means that to get to my FILESTREAM objects and my File Tables, I’m going to be using the UNC path of \\SHION\SQL2012 for my laptop. Now that we’ve got FILESTREAM going, we can go ahead and create our File Table. The first step is to set our database options to allow non-transactional access and a default virtual directory for the FILESTREAM. Next, we need to add a FILESTREAM filegroup to the database, which defines the physical directory where our file tables will exist. Note, this directory will be a physical directory, but SQL Server must create it so it cannot already exist. Finally, we can now create our file table with a simple CREATE TABLE statement. Note, we won’t declare any columns as those are pre-defined for the file table structure. And we’re done! We can now browse to the following UNC filepath: \\SHION\sql2012\FSDemo\FT_Test. This directory is the physical location of our file table. For now, I’ll put a couple test files in there. At this point, we’ll just run a simple select and, bam! There’s a listing of our files. Managing backup files: If you’re like me, you write your backups to a unique filename for each backup. This means I usually need some other tool to clean up my old files. With File Tables, I can manage that clean up completely within SQL. Restores: If you’ve got a lot of transaction logs to restore and you want an easy way to parse through files to find the ones you need, you can now do that using File Tables. Basic ETL: If you need a simple ETL solution, File Tables can give you some additional leverage so you can keep your entire solution within SQL. Thanks again to Nigel Sammy for hosting this month’s T-SQL Tuesday. There’s so much new with SQL 2012, it’s good for Nigel to give the community a chance to share some of the new features that are now out. Enjoy the rest of T-SQL Tuesday #29! Yesterday I read an interesting post by the inimitable Brent Ozar (b|t) on time management. Good stuff, much of which I already do or try to do. Shortly after reading it, I had a brief Twitter exchange with Brent and Steve Jones(b|t), essentially on whether or not these were just rules for consultants or if they worked for us corporate folks as well. Personally, it’s been my experience that not only can you follow these rules, but that you really should if you don’t want to burn out and still accomplish your goals. First off, if you haven’t read Brent’s post, go read it. I’ll wait. Cool, now that you have context, I want to basically give my thoughts on each of the rules and how I put them into practice in my own work day. #1 Decide you want to be incredible – One of my favorite tweets from @FAKEGRIMLOCK is “BE SELF. ITERATE UNTIL AWESOME.” The first rule is really that simple. You don’t have to change who you are, you don’t have tap into some hidden fount of knowledge…you just need to be yourself, awesomely. This is something that can be done in a corporate job as easily as anywhere. #2 Never budget less than whole day increments of time – Let’s not take this one quite so literally. What I take from this is to devote blocks of time to my tasks and reduce distractions. Whether it’s 4 hours or 2 or 8 (if I can get away with it), I use that block ONLY for the designated task. Don’t multi-task, because it becomes harder to focus and get things done. The key is to reduce/eliminate distractions. Map – Map out my time, schedule my work. If I’ve got 2 hours, I plan to put 2 hours into a project. Don’t work on anything else. Keep in mind, sometimes the work is planning out your other work. Reduce – Do work that reduces your other work. Can you build better maintenance for your systems? Can you communicate with people outside of meetings? Take control of your time and put effort into removing the distractions that could disrupt you. #3 Leave one whole day per week to do absolutely nothing – For me, this translates to one word: disconnect. We live in an a world and a culture where it’s easy to always be working, where we’re checking our email constantly, looking at alerts, responding to internal customers, monitoring our servers. Why? The world and the company will go on without you for a while, take a break for yourself when you need to. IT has a reputation for burning people out, but I think that’s because people let the job control them instead of the other way around. Take a break, breathe, and do something else. Life is too short, you need to remember that we work so that we can do the stuff we enjoy. Fortunately for many of us, we enjoy our work, but that can’t be the entire definition of who we are. And if you’re working a job where your boss expects that? Time to get a new job. There are companies out there that respect the work/balance, go work for them. You’ll feel better for it. #4 Leave one more solid day to pounce on incredible opportunities – Not much else to say here, though I would add that incredible opportunities can happen inside your company, they don’t just come from without. Also, some opportunities are self-generated. An example from my work: My job doesn’t have any formal SLA’s defined for the database team. I saw the need and am driving that project. My bosses and co-workers are taking note of my initiative. Sometimes pouncing on an opportunity is simply being a leader. #5 If the incredible opportunity runs more than a few weeks, it’s work – Maintain your balance. When you take on additional projects or tasks, make sure they fit into the overall scheme that is your work/life pie chart. #6 Say no early and forcefully to everything else – Much has been written about the necessity of the 40 hour work week. Since we can’t do everything, at some point we need to be able to say “no”. This is the hardest piece, especially in a corporate environment where you have a team that depends on you or management you want to impress. However, you’re only human and sometimes work just isn’t going to get done. This actually loops back to #3, because if we take on more than we’re capable of doing, everything else suffers. Let’s not confuse this with neglecting what the company requires of us. There are times we’re going to need to work on things we may not like (stupid SSRS). What we need, as corporate employees, is the freedom to cry “uncle!” when there’s too much on our plates. Sometimes it’s having a teammate take on that extra project, others it’s pushing out deadlines. Really, all we’re trying to manage here is our overall workload so we’re not trying to do too much. And if you’re working a job that won’t let you say “no”, that doesn’t trust you enough to accept a “no”, then maybe it’s time for a new job. Just sayin’. I think Brent’s rules are a great and hopefully this puts a little more perspective around them. While my personal approach is worded differently, I think the main principles are the same. What’s important is that there’s no reason why you can’t follow these rules in a corporate world, that these aren’t just for consultants. Sure, you won’t follow them to the letter, but that’s not the point. The goal is that too often we let our time manage us when it should be the other way around. Turn that corner, take control, and you’ll find everything changes for the better. DBA. I’ll be honest, there are times I *hate* that title. People toss it around without really understanding what it means. Heck, how many of us specialize in backups, monitoring, and high availability solutions only to get a call from a recruiter who has an “immediate need” for an expert in SSRS and cube design. Unfortunately, this is a direct result of non-database folks not really understanding what we do. They simply see “database” on our resume and figure that if a database is involved, we know how to handle it. We’re often considered a Jack-of-all-trades, the IT handyman. This has evolved from the roles we have to play in our careers and how so many of “fell” into a database career. The rule of thumb is that the smaller the shop, the greater our breadth of knowledge needs to be. While I’ve been a SQL Server administrator for over ten years now, my job responsibilities have required me to learn something about networking, Windows server administration, .Net development, report writing, and Oracle administration (amongst many, many other topics). Because so many things touch a database, we’re expected to understand all of these different pieces as well as the database itself. Building your personal network. This is more than just the SQL Server community (fantastic as it is). Sure, attending user group meetings has helped me find experts in areas of SQL Server I’m not as knowledgeable in. But you’ll need more than that. I have Oracle DBA friends, hardware geek friends, sysadmin friends…..you get the idea. By building out this network, I always have someone I can go to if I’m out of my depth. Stay educated. Sure, we spend a lot of time learning about SQL Server, but remember why we get into this business in the first place. Technology is cool, so keep learning about it. Pay attention to trends and tech so that when your boss comes to you about something, you won’t be caught by surprise. And if you *are* surprised, don’t sweat it, but make some time that day to read up on whatever they were talking about. Write it down. When you do something, document it! So many people bemoan documentation, but the cold hard truth is you’re going to forget something when your focus gets completely shifted the next day. Being a small shop DBA means you’re going to get bounced around on a lot of different things, so you need to record what you do so that you don’t have to relearn it later. Being a small shop DBA can be a tough gig, but it’s where most of us cut our teeth. Hindsight being 20/20, there’s a lot I’d do differently. Fortunately, Argenis Fernandiz (b|t) has given us this great T-SQL Tuesday topic for us to share with our SQL family and help others learn from our experiences. The biggest lesson I would take out of all of this is that, while our job requires us to generalize most of the time, we can really only advance our careers when we specialize. If you’re simply treading water at your current job, pick some part of the SQL Server platform that interests you and focus on it. Once you start becoming an expert at something, opportunities will open up for you along with more interesting work and learning. That will start you along the path of moving beyond being a jack of all trades and becoming an ace in the database deck.